The recipe for Renaissance-style romance begins with an intimate dinner on a fourth-floor private terrace on the Ponte Vecchio, Florence’s signature arch bridge. Four Seasons Hotel Firenze has secured exclusive access to the bridge’s only open-air terrace, tucked above the glittering jewelry boutique Dante Cardini. As the sun sets, savour unparalleled views of the Arno River before indulging in a four-course gourmet meal designed by Michelin-starred chef Vito Mollica and prepared on-site. Inspired by the many jewelry stores located along the Ponte Vecchio, Mollica’s decadent menu features an unexpected ingredient: gold. After dessert, shop for a stunning keepsake at Dante Cardini. Specially designed to complement this once-in-a-lifetime experience, the jeweler’s “Four Seasons” ring – with white gold, diamonds and a rose sapphire – is just one of the many dazzling pieces you’ll discover. Or experience a romantic dinner on the Altana Terrace on the Hotel’s roof, with magnificent 360-degree views over Florence. Four Seasons Hotel Firenze is a living museum of art history. The Hotel comprises two Renaissance palaces, whose previous residents include a Pope, an order of nuns and five centuries of Florentine nobility. Today, the Hotel’s colorful history unfolds through its ornately painted and crafted interiors, which have returned to their original beauty following seven years of painstaking restoration. Behind its classical but unassuming façade, the Hotel will offer its guests the rare opportunity to view 15th – 19th century art works in their original context. Frescoes, bas-reliefs, stuccoes and silk wallpapers have been carefully restored to reveal vivid detail dating back over five centuries. 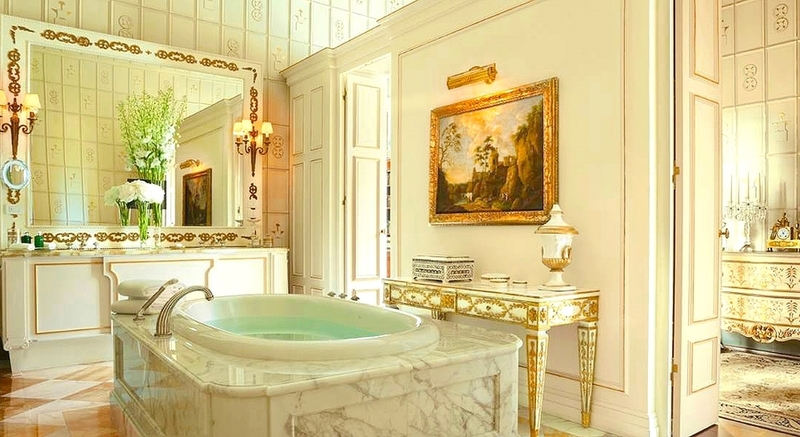 Original works of art and architectural detailing can also be found in several of the Hotel’s 116 bedrooms, suites and bathrooms. The Four Seasons Firenze offers 758 square meters of frescoed rooms, perfect for banquets and parties, as well as wide outdoor spaces for exclusive events in the 4.5 acre garden. The main hotel banquet space is made from what was once the church of the convent. This room can host events for 150 seated guests. The ex-church of the Conventino has been brought back to its original design of the XIX century, with vaulted ceilings and frescoed walls, offering an inviting atmosphere for parties and galas. The Conventino offers the privacy of a hotel within a hotel. Another large room is the Ballroom of the Palazzo Della Gherardesca, at the main floor of the palace, accessible from the grand staircase. For about three centuries the hall, decorated with frescoes of the seventeenth century, has been the official Ballroom of the Della Gherardesca family. Today it can host meetings up to 90 persons. During the eighteenth century the Della Gherardesca family commissioned a series of frescoes depicting the family’s history. These frescoes, which are in the Gallery and in the Ballroom of the family, were painted by artists of the late Baroque such as Vincenzo Meucci (1694-1766) and Giovanni Domenico Ferretti (1692-1768). The opulent courtyard of the fifteenth century, today the hotel lobby, with its frescoes, bas-reliefs and stucco, is a clear example of the wealth glitz typical of Renaissance. The author of the courtyard’s bas-reliefs is Bertoldo di Giovanni, the protagonist of the late fifteenth century’s Florentine sculpture, assistant and co-operator of Donatello and teacher of Michelangelo with others. The 16th-century frescos and masks in the courtyard are an addition of the Medici period, executed by Flemish mannerist Jan van der Straet, also known as Giovanni Stradano. At the heart of Four Seasons Hotel Firenze waits a delightful surprise: a hidden garden – the Giardino della Gherardesca – a sanctuary of giant shade trees, vast lawns and vibrant flowers. Though one of the largest Florentine gardens – measuring 4.5 hectares (11 acres) – this walled park has been kept private and unseen for hundreds of years. Originally planted as a Renaissance garden in the 15th century, the Giardino has been restored to its 19th century design, presenting a showcase of rare and endangered botanical species. Amongst the most striking: Taxus Baccata, a decorative evergreen known as the longest living plant in Europe; and a Thuja tree, an aromatic conifer called the “tree of life” for its homeopathic properties. The private Park Della Gherardesca offers a wide selection of functional lawns and private dining areas within its 11 acre gardens, a perfect location for outdoor wedding ceremonies, banqueting, and special events. The 116 rooms and suites are different from each other; many have unique details such as original murals, friezes and bas-reliefs, skylights and extraordinary storied ceilings, monumental staircases and fireplaces. 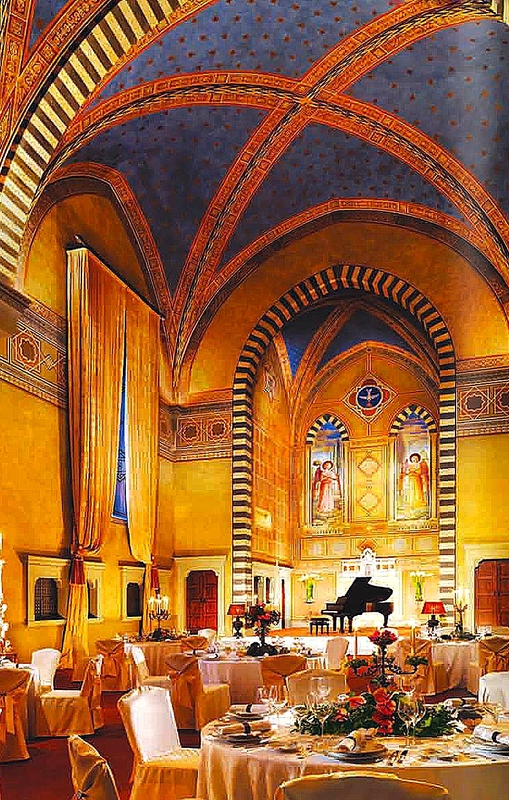 The rooms’ interiors were designed by architect Pierre-Yves Rochon in two main colors, yellow-clay and green-cypress, in honor of Tuscany; the suites have maintained the historical details and frescoes of that epoch. The Villa is a quiet suite in the hotel garden. Made from the Conventino’s lemon-house, it includes a master bedroom, a living room, and an area devoted to a whirlpool bath, overlooking the private terrace. The sunlight floods through the full-length windows, offering a beautiful view over the surrounding private garden. The central part of the Royal Suite Della Gherardesca is a long gallery with vaulted ceilings illuminated by five large windows that overlook the hotel park. The ceilings are beautifully frescoed and the floor is made of original Capodimonte ceramic of the eighteenth century, by Ignatius Chiaiese. The suites have maintained the historical details and frescoes of that epoch. The main floor, in the Renaissance heart of the palace, is composed of eight suites: one of the most important is the Volterrano Suite with frescoes dating back to the nineteenth century and Chinese hand-painted wallpaper. 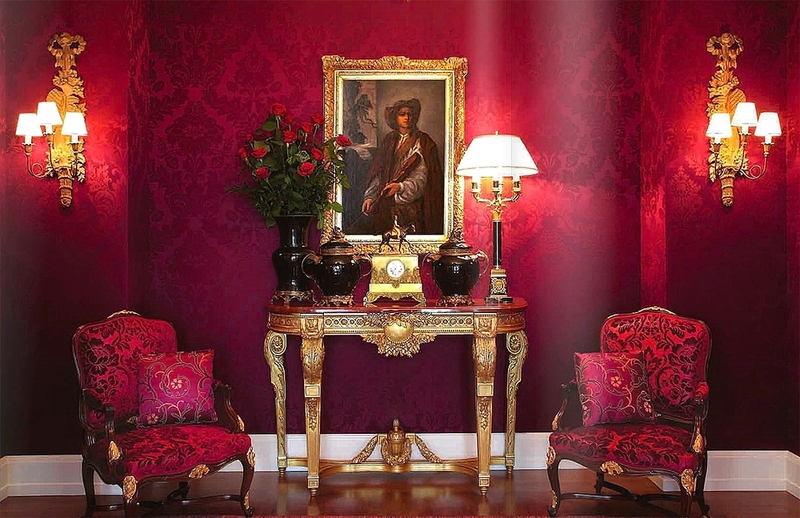 The theatricalism of the late Baroque is present in the precious decoration of the suites on the main floor. Commissioned in the early seventeenth century to Baldassarre Franceschini (1611-1689), known as "the Volterrano". The Palagio is the main hotel restaurant. It is located in the Palazzo Della Gherardesca and overlooks the garden, where the terrace offers charming outdoor lunches and dinners. The main hall, which once was the palace’s stable, is decorated in light silver and lilac nuances and still keeps its original columns and vaulted ceiling, lit by six beautiful Murano chandeliers. Inside “Il Palagio”, the wine bar occupies a space delimited by fridge-window walls. It offers over 400 labels, including 50 wines by the glass. The Conventino, in turn, suggests La Magnolia, a small and intimate room for à la carte breakfast. The Hall, built as a secondary courtyard inside the Palazzo Della Gherardesca, was considered unusual for its large internal space. Covered by an elegant glass pyramid from which a splendid wrought iron chandelier hangs down, the courtyard has become the Atrium Bar. For more images go to my pinterest page. You are welcome to pin images directly to Pinterest. Click below on the button 'Images Optimized For Pinterest'.